Under an agenda of resource extraction and counter terrorism, the United States and its allies have increased their global military operations. This call will inform listeners on the social and political impact of these policies in Africa and provide strategies and ideas for making connections with activists and communities of color in the United States. 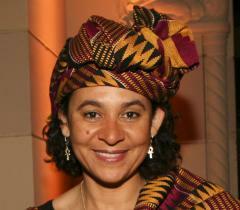 Dr. Amina Mama is a Nigerian/British feminist activist, researcher and scholar. Her main areas of focus have been post-colonial, militarist, and gender issues. She has lived in Africa, Europe, and North America, and her books and research include culture and subjectivity, politics and policy, women’s movements, and militarism. She is currently a Professor and Director of Women and Gender Studies at the University of California, Davis. This teleconference has been organized by the Human Security and Anti-Militarism Working Group of the US-Africa Network (USAN). To learn more about this Working Group, visit the USAN website or contact us at ­­­usan.hsam@gmail.com. A recording of the briefing will be posted on the USAN website shortly after the call.